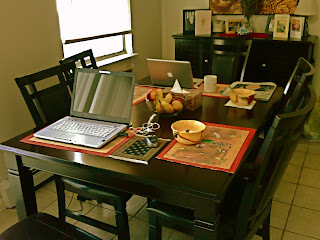 As you can see from the photo above, our dining room table has become somewhat of a non-communicative place where we eat breakfast, check our email, networking sites, read the paper and then say goodbye for the day. I’m not sure if it was in fact a good idea to get Madelene her own computer, but at least she’s getting more acquainted with current up to date news and other misc. junk from whatever sources she looks up. She has never really had her own computer - she used mine since she rarely gets on the net. 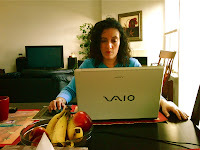 Now that her work involves a bit more computer work, I told her it was important that she gets familiar with the internet to better assist her clientele with more information. 1. When we go to bed, the BlackBerries are turned off. There are no ifs ands or buts about it. They’re off for the entire night. If there is an emergency, then call our landline. 2. Our days off are just that: no internet, other than uploading any videos we have made that day. Only in the morning will we surf the internet for news and info and share with one another. 3. A few “I love yous” tossed across the table with an instant message is always appreciated. It’s weird though, by her having a computer, it has actually brought us closer. She’s an excellent writer, so sometimes we’ll just be sitting here in the morning with our coffee writing together and sharing ideas. There are many things I have learned about her through her writing. She may start writing in her blog again, which I’m excited about. She’s somewhat of a private person, but isn’t afraid to share her ideas, faith and stories from her heart with the world. I guess I’m just happy with everything... We’ve had our ups and downs in the past and this last shot of trying it out again has been such a beautiful experience. And after we got married, it has only gotten better and better. I know that sounds strange, but I feel like I’m ‘dating’ a completely new person, yet a person I already know and have yet to learn about. It still feels new. Some would say it’s the “honeymoon phase” of our relationship - but come on - after 14 years of being together? When she comes home from work, I’m at the door like a puppy wagging my tail. We never run out of things to say to one another and we are constantly yip-yapping until we fall fast asleep at night. And believe me, when I first dated her we had not one thing in common. She kept insisting that opposites attract. I begged to differ, but somehow we just “worked”. Now, it seems like we have everything in common, and I guess the whole point of this post is: I truly found my best friend. We share the most important things in my opinion: our faith in God/Christianity, our political views, family values and now we share in the same hobbies and activities. So, let the table be messy and full of things we love to do. Let the house have a little more clutter for our hobbies and interests. I guess by being so clean and tidy, it prevented us from sharing in many things. I guess it’s not so non-communicative after all. Hope all of you enjoy your holiday!